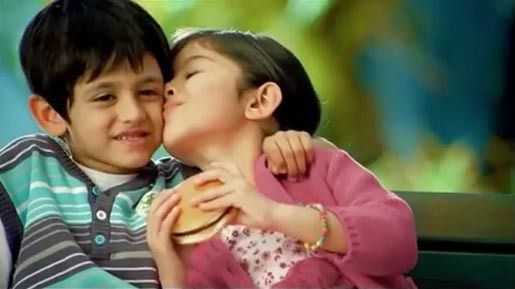 McDonald’s is advertising the McAloo Tikki burger and Fries in what has become a popular and controversial advertising campaign in India and the Philippines. The Boyfriend/Girlfriend (BF/GF) television commercial at the centre of the campaign features two young children sitting on a bench. The girl asks the boy if he would consider them boyfriend and girlfriend. He is not keen, saying that girlfriends demand too much. He changes his mind when she says that she’d be satisfied with a McAloo Tikki burger (India) or McDonalds Fries (Philippines). The Catholic Bishop’s Conference of the Philippines has slammed the ad, saying that it trivialises relationships. Another ad from the same campaign has a young man meeting his girlfriend at the mall, only to discover she’s brought her little sister as well. Happily for him, her appetite can be appeased with an affordable McAloo Tikki burger and sundae. The Boyfriend/Girlfriend and Sister ads were developed at Leo Burnett India, Mumbai, by creative Nitesh Tiwari, agency producer Manoj Pillai, art director Pravat Mati, music director Rupert Fernandes. Filming was shot by director Nitish Tiwari via Opticus, Mumbai, with producer Sanjay Shetty, director of photography Ravi Verman, casting director Mukesh Chhabra, line producer Jayraj Amin, production manager Ganesh Rasal, 1st art director Karthik Bhat, art director Sukirth Rao, stylist Reena Manavath and Ruchika Ittal. Post production was by Colorist was Miten at Pixion, offline editor Ravindra Rakhashia and online editor Saby at Famous Studios, Mumbai, sound engineer Chester, and post supervisor Mahesh Kamble.